fire in Sendai's industrial area A total of27,149 businesses in three prefectures were damaged by the March 2011 earth. 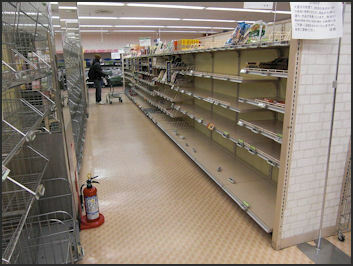 Among commercial and industrial businesses affected by the disaster in Iwate, Miyagi and Fukushima prefectures, 22 percent were closed temporarily or permanently. Progress has been slow in rebuilding main industries in coastal areas, such as seafood processing, and about 65,000 people were still looking for work at the end of 2011. Tohoku Electric Power Co. suffered 173.1 billion yen in losses because of severe damage to its electric power facilities, while JX Holdings Inc. incurred a 137.4 billion yen loss as its refinery was damaged by the disaster. Sumitomo Metal Industries Ltd. incurred a 74.3 billion yen loss, and Nippon Paper Group Inc., 71.1 billion yen. A total of 1,135 of Japan’s 1,597 listed firms---including some of Japan’s best known companies’suffered earthquake and tsunami damage. Of these 529 companies said they suffered building damage. In the tsunami-devastated areas even factories two kilometers inland were wiped out. These included a Sony factory that made Blu-ray discs, a Hitachi factory that makes parts for nuclear reactors and Renesas Electronic factory that makes LSI chips. Inland a Shiseido shampoo was decimated by the earthquake. There many companies had to start from scratch in their rebuilding efforts. In the electronics industry some producers were unable to resume production because their factories were located within the 20-kilometer evacuation zone around the Fukushima nuclear power plant. In many cases companies that usually competed against one another to provide assistance to their common parts suppliers and helped each other secure needed parts. Short term shortages in Sendai The car industry was hard hit because about 30,000 parts are needed to make a car and many precision parts are so specialized they have no substitutes. This means that if production of these parts is disrupted then production of the cars made them also have to be halted. Among the auto parts factories shut down by the disaster were: 1) Kanto Auto Works in Kanegasakicho, Iwate Prefecture which makes body parts assembly for Toyota; 2) Central Motors’s Miyagi in Ohiramura which makes body parts assembly for Toyota; ; 3) Keihin Corp’s Kakuda plants in Kakuda, Miyagi Prefecture which make vehicle parts for Honda; 4) Iwaki Diecast Co. in Yamamotocho, Miyagi Prefecture which makes auto parts; 5) Naime Japan Brake Co. in Namiemachi, Fukushima Prefecture which makes brake parts; and 6) Nissan’s plant in Iwaki, Fukushima which makes engines. Production at Japans’ automakers in terms of domestic output fell between 50 percent and 65 in March 2011, when the earthquake and tsunami occurred, and the months that followed main due to supply chain disruptions caused by a shortage of parts. Automobile production in April fell 60.1 percent from what it was the previous year. Only 292,001 vehicles were produced, down from 731,829 made in the same month a year earlier. Auto factories that stopped production were able to restart production within a few weeks the plants were unable to operate at full capacity because of parts shortages, In the early going about 500 parts were hard to get. By late April 150 parts were hard to get. These included microcontrollers that regulate the engine and other systems. Brake parts and chemical products such as coating materials and paint---most of which modern 30,000-part cars can not be produced without. By May the number of kinds of parts needed by Toyota had fallen to 30. Car sales in Japan in April 2011 were 51 percent power than the year before and even lower than April 2009 when the car industry was suffering during the fallout of Lehman Brother shock. In the United States, Bloomberg reported, “other automakers---particularly Hyundai, Kia, Ford and General Motors---were celebrating record first-quarter profits, largely on the backs of new, compact, fuel-efficient models. The success of small cars from Korean and American manufacturers comes at the expense of sales from Japanese brands.” The trend continued for several months. U.S. Sales for Toyota and Honda fell 21 percent in June while sales for the “Big Three” American autmakers recorded double-digit growth. The release of new models was delayed and dealers suffered as their stocks of new cars dwindled as new supplies arrived from the factories. Even showrooms were empty, One salesperson told the Yomiuri Shimbun, “We get customers coming in, but we don’t have cars to sell them. Supply chain disruptions caused by a dearth of parts is to expected to be fully repaired until the end of 2011. Even if that problem is solved quickly car companies still have deal with power shortages in the summer of 2011. Declines in the auto industry hurt the Japanese economy as a whole. It also hurts materials producers and parts suppliers and hurts the competitiveness of Japanese brands overseas. 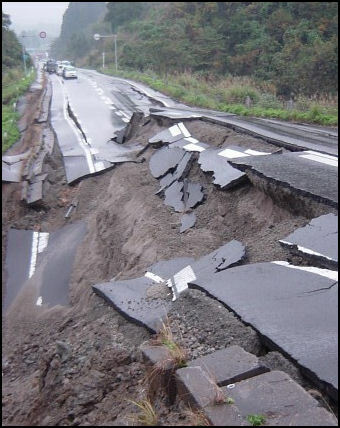 At 5:56pm on October 23, 2004, an earthquake measuring 6.8 on the Richter scale hit the Chuetsu region of Niigata prefecture. A total of 67 people died and 4,805 were injured. About 13,000 buildings were destroyed or severely damaged and more that 100,000 people were evacuated. The 6.8 earthquake was one jolt in series of seven earthquakes that occurred over a two hour period that were followed by a series of aftershocks, some of them quite strong, that continued into December. By some estimates the earthquake caused $13 billion in economic damage because of delays and lower production. Factories in Niigata that produce fine fabrics and precision equipment were forced to shut down. A large Sanyo chip-making plant was shut down. Sanyo had originally planned to post record profits but the earthquake caused it to post loses for the year. 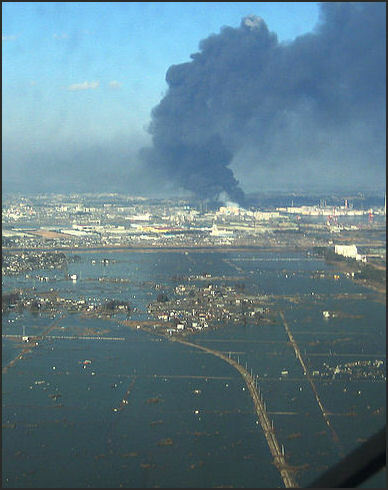 Matsushita and Sharp factories in the area were also affected. 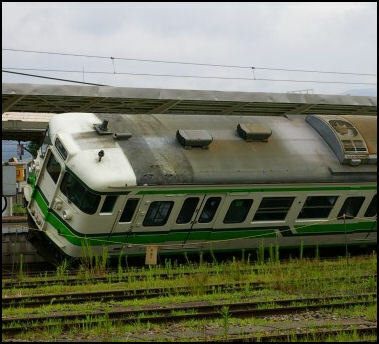 On July 16, 2007, an earthquake measuring 6.8 on the Richter scale struck Kashiwazaki in Niigata Prefecture, killing 15 people, injuring 2,300 and damaging 14,000 homes. Cracks opened up on roads and major expressways. A fire broke out at a nuclear power plant. Tremors were felt as far away as Tokyo. Damages from the quake were estimated do be around ¥1.5 trillion. The earthquake affected he automobile industry by closing or slowing suppliers whose factories were damaged by the quake which in turn forced the temporary closure of some assembly plants that relied on parts from these suppliers. Toyota was forced to halt production at all of its plants for two days ands saw production drop 9.5 percent for the month, showing vulnerabilities of the “Just in time” production strategy. The closure of an auto parts plant that made piston rings in Kashiwazaaki affected the production of engines outside the region and that in turn affected the making of cars, and caused all 12 Japanese car makers to shut their production lines. The plant, owned by the Riken Corp., makes 50 percent of the piston rings for the Japanese market The rings are made to very precise specifications. Bringing in other manufacturers would require Riken to reveal production secrets. Automakers production fell by 120,000 units. Toyota alone had to suspend operations at 30 plants because of the piston ring shortage. The automakers dispatched a huge number of employees to the Riken plant to get the plant back in operation, a goal that was achieved in less than a week after the earthquake. A number of other factories and businesses were also affected. Text Sources: New York Times, Yomiuri Shimbun, Daily Yomiuri, Washington Post, Los Angeles Times, Kyodo News, National Geographic, The Guardian. Times of London, The New Yorker, Time, Newsweek, Reuters, AP, AFP, and various books and other publications.